Read Kelsi's review of The Hummingbird Project. Cousins from New York, Vincent (Jesse Eisenberg) and Anton (Alexander Skarsgård) are players in the high-stakes game of High-Frequency Trading, where winning is measured in milliseconds. Their dream? To build a straight fiber-optic cable line between Kansas and New Jersey, making them millions. But nothing is straightforward for this flawed pair. Anton is the brains, Vincent is the hustler, and together they push each other and everyone around them to the breaking point with their quixotic adventure. Constantly breathing down their necks is their old boss Eva Torres (Salma Hayek), a powerful, intoxicating and manipulative trader who will stop at nothing to come between them and beat them at their own game. 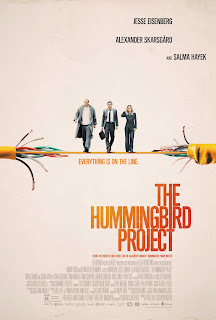 The Hummingbird Project is in select theaters on March 22nd, 2019. 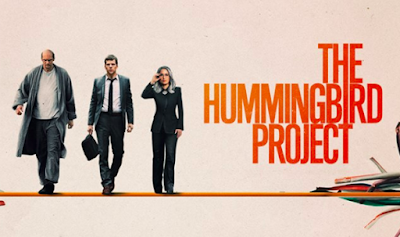 The Hummingbird Project is all about striking it rich, making millions from milliseconds. In a world where everything is fast and tech, what matters most is who gets the data quickest. Two cousins, Vincent (Jesse Eisenberg) and Anton (Alexander Skarsgård), scheme up a plan to create the fastest means of conducting high-frequency trading. Vincent, the hustler, creates a plan by which he produces a fiber-optic cable that will stretch underground from Kansas to New Jersey. However, he needs his cousin Anton, the brains, to configure an algorithm that will lower the number of milliseconds it takes for the data to travel across their line. So what’s the goal here? To create the fastest means of transportation of data and then sell it to the opposing company in order to make millions. During this top secret mission, everything you could imagine goes wrong. Between detrimental health issues and former boss Eva Torres (Salma Hayek) getting in the way of their plans, it feels as though Vincent and Anton will never finish the job. Jesse Eisenberg plays his part well, per usual. However, I was impressed by the role of Alexander Skarsgård. He completely takes on a role that is like nothing he’s ever done before. Anton is an algorithmic genius with a very atypical personality. This film is packed with emotion and of course, here and there, a few laughs. I enjoyed watching this movie and it definitely kept me intrigued.